Congratulations to "Rachael B", "Martha L", "Kathleen M", "Liz D." and "Janice H". Thank you to all who participated! When my agent first told me that I was getting a reputation for writing exciting enclave novels, I said, “Writing what?” Well, duh--enclave novels, in my case, romantic suspense novels set in small towns and the surrounding rural areas. In the rom/sus books I’ve written, I’ve used Amish settings, small town Alaska and now, again, the edge of Appalachia, an area I know well. My new trilogy THE COLD CREEK NOVELS: SHATTERED SECRETS (Sept.); FORBIDDEN GROUND (Nov.): and BROKEN BONDS (Jan.) take place in the dramatic, scary area of the Ohio Appalachian ridge, an unique enclave unto itself. I did my undergrad work at a college in that area, even student taught at a high school with some small town and “backwoods kids.” What suspense writer could ignore settings such as a defunct coal mine; a run down hunting cabin; an abandoned insane asylum; and deep cornfields surrounding an old farm house? Cell phones don’t even work in some spots. How perfect for a heroine and her small town sheriff love when they are trying to solve a terrible crime. For the first book in the trilogy, I suppose it might have seemed logical to begin with the oldest of the three sisters and keep them in order. But it’s the terrible thing that happened to the youngest that gets things rolling, so book #1, SHATTERED SECRETS, belongs to Tess Lockwood. Years later, a childhood tragedy still impacts her as well as her oldest sister, Kate, and her middle sister, Char, and the men in their lives. Tess was abducted from the cornfield behind their house when she was young. She somehow escaped after several months but remembered nothing of the trauma. The family fell apart and left Cold Creek. Now an adult, Tess is back to sell the old homestead. But another local child, the third taken, disappears during her brief stop in town. Though Tess wants nothing to do with reliving her past, she promises to help the sheriff, Gabe McCord, solve the crime. Tess can’t wait to have it all over and get out of town, but…of course, romantic and fearful consequences follow. One thing I love about this trilogy is that the books come out very close together, every other month. That made it easy for the new heroines/heroes in each book to appear in support roles in the next novels. The dynamics among three sisters can be surprising and fascinating, as any of you with multiple sisters know. There can be tension, but when trouble looms, they stick together. The three heroes all have relationships too, but that doesn’t make them seem any less dangerous at first to the heroines. Booklist said of book #1 in my previous trilogy: “Harper, a master of suspense, keeps readers guessing about crime and love until the very end.” (Starred review for FALL FROM PRIDE.) I hope the same is true for this new trilogy. I think the villain is one of the most unusual yet. Please let me know (at Karen.Harper.Author@gmail.com) if you guess who it is before the trap closes on Tess and Gabe in scenic but scary small town Appalachia. 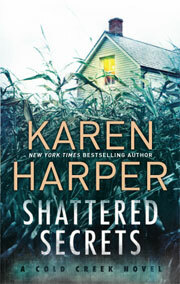 Karen will be giving away 5 copies of SHATTERED SECRETS to 5 lucky readers who stop by and leave a comment to say hello. Tess isn't ready to recall what happened to her, and she has no intention of digging up any details that might remind her of the truth. 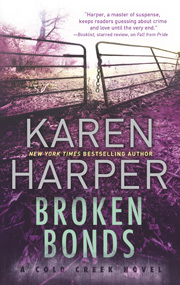 But when another child in the town goes missing, she's certain it's related to her return to Cold Creek. Together,Tess and Gabe will have to work to unlock their painful memories in order to save another child and heal their damaged souls, for good…. Giveaway ends 11:59pm EST Sep. 18th. Please supply your email in the post. You may use spaces or full text for security. (ex. jsmith at gmail dot com) If you do not wish to supply your email, or have trouble posting, please email maureen@JustRomanticSuspense.com with a subject title of JRS GIVEAWAY to be entered in the current giveaway. US Postal addresses only. I'm stopping in to say hi to Karen, and to definitely add this one to my TBR list! Hi Karen, your trilogy sounds exciting! I enjoyed the excerpt. Romantic suspense is my favorite and this one sounds fabulous. 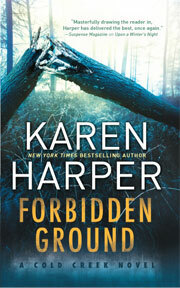 I have not read Miss Harper's books so I look forward to reading this new trilogy. Thanks for the chance to win. Congrats to Karen on the new release. I'll be looking forward to this trilogy. Trilogy on my TBR list. congrats to Karen on the trilogy! This sounds awesome :) Thanks for sharing! I like your covers, Karen. Please enter me in your draw. I grew up in a small town where there was never a shortage of conflict. Just not the type you write about. The book sounds great! I have been really your books. I just love reading mystery and to see if I can figure who done it.